Compassion, which is comprised of the prefix "com" (together) and the word "passion" (strong emotion), is the genuine concern for others in accordance with their needs or desires. Compassion can encompass strength independently from, or combined with, weakness, because both qualities contribute caring value. 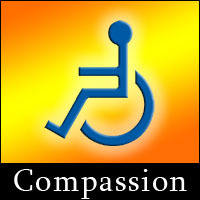 Extreme acts of compassion, which often manifest as love, may even go so far as to preserve life or facilitate death. Compassion is also a natural survival trait that is based on mutual respect, and is a fundamentally important cooperative element of rational and social-psychologically healthy communities. The absence of compassion can put a community at risk of diminishing into a dysfunctional (and often dangerous) state, potentially leading to an inexorable revolution that threatens to restore compassion as a core value in the face of definitional extinction.